If we told you there was an enormous cheese production facility located in the heart of Manhattan’s Flatiron District, would you even believe us? Well, there absolutely is! And now, thanks to Beecher’s Handmade Cheese starting on Monday, April 8th, 15th & 22nd at 7 PM, you can pair five of their deliciously domestic, artisanal cheeses with five ultra unique wines while overlooking their super-impressive cheese factory -- all going down in a super intimate loft perched above the corner of East 20th Street and Broadway! Attendees of these super intimate, twenty-two person experiences dubbed 'Pair Cheese Drink Wine' will have a bird’s eye view of Beecher’s glass-walled cheesemaking facilities and witness first-hand the production of their signature cheeses, as well as many other award-winning cheeses they produce and sell. 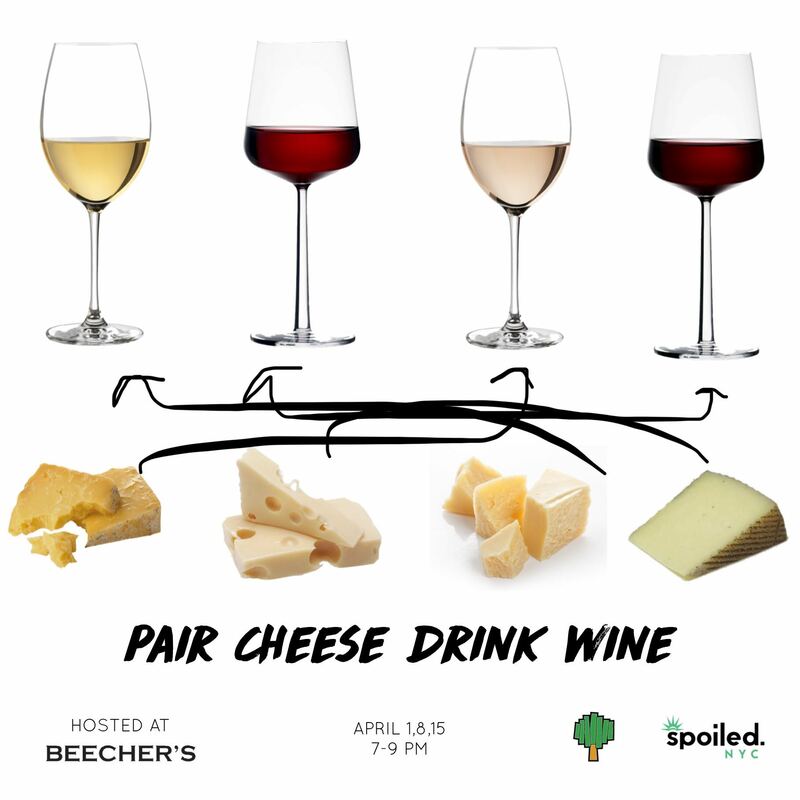 Starting on Monday, April 8th, 15th & 22nd at 7 PM, you can pair five of Beecher's deliciously domestic, artisanal cheeses with five ultra unique wines while overlooking their super-impressive cheese factory-- all happening in a super intimate loft perched above the corner of East 20th Street and Broadway! For those of you who haven't heard about Beecher's before, since first launching in Seattle's Pike Place Market in 2003, they have received numerous awards and medals of excellence from cheese competitions worldwide, including the World Cheese Awards, the American Cheese Society’s Annual Competition, the American Cheesemaker Awards and more. Alright, alright, we know what you're thinking: "Wine and cheese pairing? Hard pass." But let us explain all the deets. This is anything but your traditional, boring wine and cheese class. With help from Beecher's amazing team of down-to-earth wine and cheese experts, we've now made these experiences super relatable, casual, and fun. Still not sold? How about instead of being told which cheeses to pair with what wines and when, you'll be able to do the pairing yourself? That's right, you're in control of creating an absolutely heavenly combination of wines and cheeses, for your very own palate and taste. No judgments. The wines and cheeses presented are typically a variety of domestic, artisan assortments; Beecher's doesn't use the same cheese or wine twice, and they love lesser known wine varietals and cheeses. Sounds absolutely incredible, amirite?! The first hour and thirty minutes consists of the actual class, and for the last half hour, you'll be free to mingle and enjoy any of the wines you tasted during the event. The best part of it all? At the conclusion of the event, you'll get to enjoy a complimentary refill of your favorite from the five wines you tried. Nice! Afterwards, feel free to wander throughout the establishment, enjoy more drinks in the bar or underground in Beecher's stylish downstairs eatery appropriately called The Cellar. Plus, if you're looking for a nightcap, what better way to quench your palate than with 1/2 Price Bottle Mondays?! And in keeping with Beecher’s commitment to pure food, Beecher’s contributes 1% of all sales to the Flagship Foundation, founded by Beecher’s in 2004 to provide education about the benefits wholesome eating and nutrition. So whether you’re a die hard wine-and-cheese fan or just want to treat yourself after another day at work, you will be taught how to pair artisan cheeses with the perfect counterparts, while still eating and drinking which wines and cheeses you want when. Grab your tickets here! P.S., check out photos and more details about 'Make Pizza Drink Wine' HERE & HERE, and then take a look at some pretty amazing Instagram Stories from this event series HERE. Enjoy 'em-- and we hope to see you for a fun-filled night of pizza and wine very soon! Finally, check out photos and more details about 'Make Mozz Drink Wine' HERE & HERE, and then take a look at some incredible Instagram Stories from this event series HERE. Enjoy 'em-- and we also hope to see you for a Sunday Funday filled with fresh mozzarella and wine very soon!